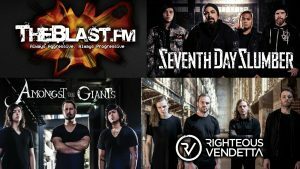 TheBlast.FM brings Rockfest Records bands Seventh Day Slumber, Amongst The Giants, and Righteous Vendetta to our home base city Sioux Falls, South Dakota for a concert on Monday, March 25, 2019 from 7:00 to 9:00 pm at the new Lifelight Youth Center at 420 S. Duluth Avenue. Doors open at 6:30 pm. Tickets are $15 at the door. Pre-sale is now over.